We invited municipal and private waste management and recycling companies at the end of June to Walldorf to our first SAP Infoday for Waste and Environmental Services and presented them the latest news about of SAP solutions and the path forward into the Digital Circular Economy. Around 60 participants followed the invitation and were interested to listen to us. Networking and exchange between the customers and partners is an intended aspect of the event and was used intensively while the breaks. Two main partners supported the industry infoday – PROLOGA GmbH and NETCONOMY Software & Consulting GmbH. We would like to thank our partners for the important support for this industry. The morning started with thinking about “turning thinking into doing” and therefore transforming commercial waste management companies into intelligent enterprises and enable municipal waste and recycling companies to make their cities intelligent. It means for enterprises and cities to effectively use existing and new data assets. The goal is to achieve the desired outcomes of faster – and with less risk. Examples for new data assets in the waste and recycling industry are IoT data and new data from customer engagement. SAP S/4HANA is the next-generation intelligent ERP and therefore the basis also for core processes in the waste and recycling industry. 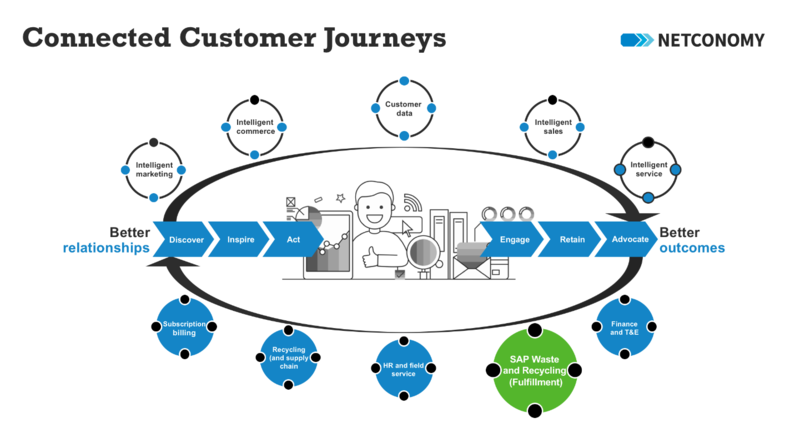 SAP’s product management started with the highlights of this new foundation for core processes and visualizes the journey for all modules in this cross-industry basis. In the second part, PROLOGA introduced the waste and recycling specific adaptation of SAP S/4HANA. The extension for the industry specific logistics “SAP Waste and Recycling” is available in SAP S/4HANA 1709 that means more than one year now. One of my highlights was the insights into the modern interaction center solution with the available with SAP S/4HANA for customer management. It replaces the CIC0 SAPGUI transaction from the classic SAP ERP release that was commonly used by SAP Waste and Recycling customers for call center processes. Commercial waste management companies already recognized a big market pressure away from more costly call center and direct sales towards cheaper customer engagement. Smart Cities will certainly follow after consolidated citizen engagement is identified as key innovation for the citizen. 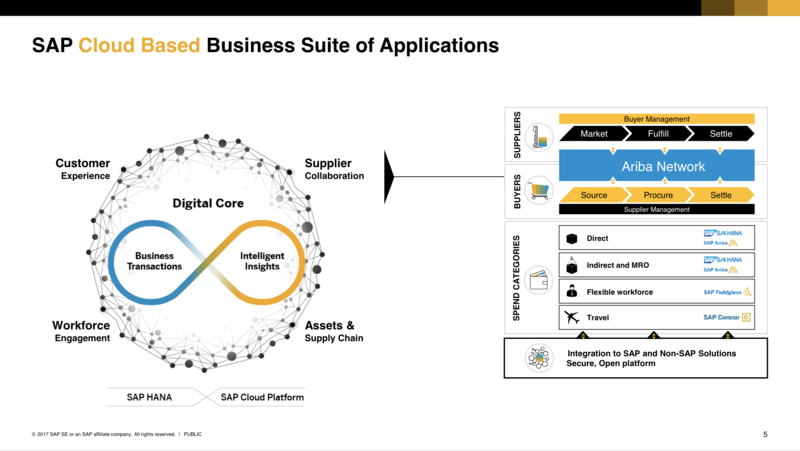 The partner NETCONOMY presented SAP’s standard solution for omni-channel custom engagement – SAP Commerce inside SAP C/4HANA. Customer portals and customer self-services on top of that solution receives the casual end user experience that everyone knows from leading commerce portals. It is a competitive advantage to create synergies with the leading customer engagement companies in the other sectors because of the expected changes in technologies such as new occurring interaction channels with customers and citizens. Structured collection of data will help waste and recycling companies to reduce interaction costs and to automate the customer centric business processes. The intelligent enterprise therefore starts with data collection in customer interaction processes. The second topic for data driven innovations is Internet of Things (IoT) for containers and other equipment inside waste and recycling companies. Special guest on stage were Digital Agentur Heidelberg, a company of smart city Heidelberg. The representatives of the city gave some insights about the smart waste project that is running with multiple partners. Pilot use case are LoRa WAN based battery sensors in waste glass containers. 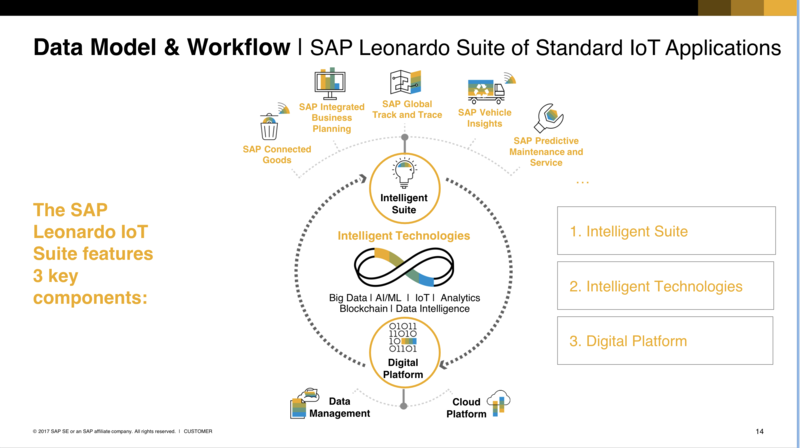 SAP is the IoT solution partner with the ready-to-run solution SAP Connected Goods that can handle also upcoming other IoT scenarios in waste collection such as compacting containers and in other business activities of the city. Hardware partner of the city for the new LoRa WAN sensors is Pepperl+Fuchs and for the LoRa WAN gateway Smart City Solutions. Interesting for our participants were the exchanges in the break-out session with these hardware partner and the possibility to touch some LoRa WAN hardware in the real world (see video of previous mobile network fill level sensors). New data insights will make waste collection and execution of environmental services intelligent with benefits for the citizen in a smart city. The infoday included also some recommendations for the transformation of the Lines of Business solutions for human resources and for procurement. The waste and recycling industry is also following the the trend to moving to public cloud solution especially in business process that are not part of the core processes – such processes are much more standardized, non-differentiating and defocus limited IT capacity in waste management companies. My colleagues from SAP Successfactors and SAP Ariba gave some overviews as appetizer for more detailed about the IT transformations in HR and in procurement. Last but not least, PROLOGA presented in a specific break-out event also their specific consulting solutions that are working with specific customers. 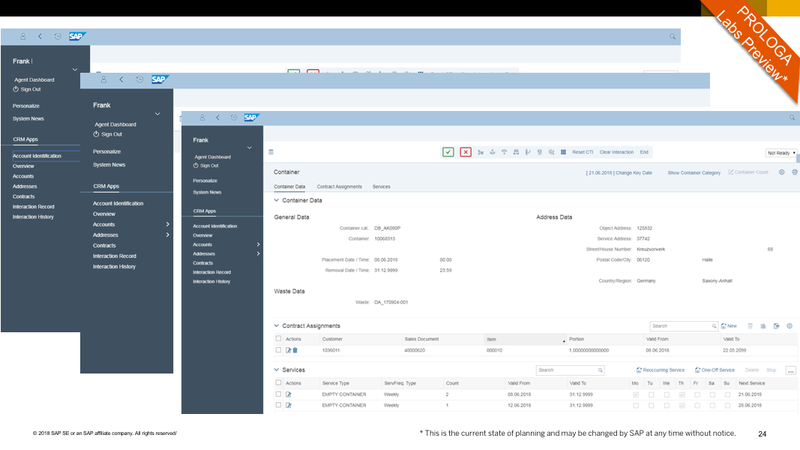 SAP Cloud Platform is used in more and more cases to renew and extend business process in SAP ERP and SAP S/4HANA. The same cloud platform is also increasingly by SAP Waste and Recycling customers as development platform for customer specific extensions. We are working with our members of the SAP Advisory Council for Waste and Environmental towards a public cloud strategy on top of SAP S/4HANA Cloud, SAP Cloud Platform, SAP C/4HANA, SAP Leonardo and SAP’s cloud solutions. Stay tuned… we are looking to exchange with all of our customers that are interested in moving to the cloud. All of our customers and partners can see the latest updates towards the cloud with a free software tool that helps to shape the IT strategy for CIO in the industry – our SAP Transformation Navigator. 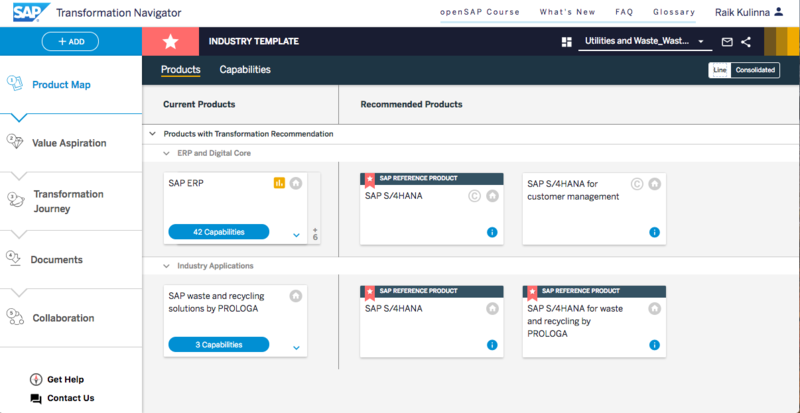 The online tool contains segment-specific content for the waste and recycling industry, could read usage data from the current SAP systems as starting point if permissions are granted by the SAP customers and enables end customers to individually configure their own IT transformation roadmap. The long list of SAP solutions are individually sorted out as part of such a transformation journey so that the IT strategy becomes more clear and transparent. If help is needed then please don’t hesitate to contact me or your SAP sales contact. We are looking forward to meet you (again) at our next infoday. We are very excited about what lies ahead!